37 CFR 1.935 Initial Office action usually accompanies order for inter partes reexamination. The order for inter partes reexamination will usually be accompanied by the initial Office action on the merits of the reexamination. (4) Subject matter which is developed by another person which qualifies as prior art only under 35 U.S.C. 102(e), (f) or (g) may be used as prior art under 35 U.S.C. 103 against a claimed invention unless the entire rights to the subject matter and the claimed invention were commonly owned by the same person or subject to an obligation of assignment to the same person at the time the claimed invention was made. (ii) For purposes of paragraph (c)(4)(i) of this section, the term “joint research agreement” means a written contract, grant, or cooperative agreement entered into by two or more persons or entities for the performance of experimental, developmental, or research work in the field of the claimed invention. (iii) To overcome a rejection under 35 U.S.C. 103(a) based upon subject matter which qualifies as prior art under only one or more of 35 U.S.C. 102(e), (f) or (g) via 35 U.S.C. 103(c)(2), the applicant must provide a statement to the effect that the prior art and the claimed invention were made by or on the behalf of parties to a joint research agreement, within the meaning of 35 U.S.C. 103(c)(3) and paragraph (c)(4)(ii) of this section, that was in effect on or before the date the claimed invention was made, and that the claimed invention was made as a result of activities undertaken within the scope of the joint research agreement. (ii) Which was the same subject matter waived in the statutory invention registration. The first Office action on the merits will ordinarily be mailed together with the order granting reexamination. In some instances, however, it may not be practical or possible to mail the first Office action together with the order. For example, the reexamination file may have been provided to the examiner too late to include an Office action together with the order and still meet the deadline for mailing the order granting the request. Another example is where certain information or copies of prior art may not be available until after the deadline. In these situations, the order would be prepared and mailed, and the Office action would be mailed at a later date. In addition, a first Office action is not mailed with the order where the files will be forwarded for decision on merger of a reexamination proceeding with another reexamination proceeding and/or a reissue application. Rather, an Office action would be issued after the merger decision, as a single action for the merged proceeding. See MPEP § 2686.01 and MPEP § 2686.02. Where the order will be mailed without the first Office action, the order must indicate that an Office action will issue in due course. Form paragraph 26.04 should be used to inform patent owner and requester that the action was not inadvertently left out or separated from the order. An Office action on the merits does not accompany this order for inter partes reexamination. An Office action on the merits will be provided in due course. Where the Office action cannot be mailed with the order, the Office action should, in any event, be issued within two months from the mailing of the order, unless the case is awaiting merger, in which case the Office action should be issued within one month from the mailing of the merger decision. Where all of the patent claims are found patentable in the first action, the examiner will issue an Action Closing Prosecution (ACP). The ACP is discussed in MPEP § 2671.02. Where the examiner determines that one or more of the patent claims are to be rejected, the first Office action on the merits will be similar to a first action on the merits in an application (or ex parte reexamination) where a rejection is made. In this situation, even though the action will follow the format of an action in an application, inter partes reexamination practice must be followed. Accordingly, inter partes reexamination forms will be used, special inter partes reexamination time periods will be set, inter partes reexamination form paragraphs will be used, and the patent owner and the third party requester must be sent a copy of the action. The examiner’s first Office action will be a statement of the examiner’s position, and it should be sufficiently complete so that the second Office action can be an Action Closing Prosecution (ACP). See MPEP § 2671.02. Accordingly, it is intended that the first Office action be the primary action to establish the issues which exist, such that the patent owner response and any third party comments can place the proceeding in condition for the issuance of an ACP. The examiner’s first action should be comprehensive and address all issues as to the prior art patents and/or printed publications. The action will clearly set forth each ground of rejection and/or ground of objection, and the reasons supporting the ground. The action will also clearly set forth each determination favorable to the patentability of claims, i.e., each rejection proposed by the third party requester that the examiner refuses to adopt. Reasons why the rejection proposed by the third party requester is not appropriate (i.e., why the claim cannot be rejected under the ground proposed by the third party requester) must be clearly stated for each rejection proposed by the third party requester that the examiner refuses to adopt. Comprehensive reasons for patentability must be given for each determination favorable to patentability of claims. See MPEP § 1302.14 for examples of suitable statements of reasons. The examiner should not refuse to adopt a rejection properly proposed by the requester as being cumulative to other rejections applied. Rather, any such proposed rejection must be adopted to preserve parties’ appeal rights as to such proposed rejections. In addition to the grounds and determinations set forth in the action, the first action should respond to the substance of each argument raised in the request by the third party requester pursuant to 37 CFR 1.915. In addition, the action should address any issues proper for reexamination that the examiner becomes aware of independent of the request. 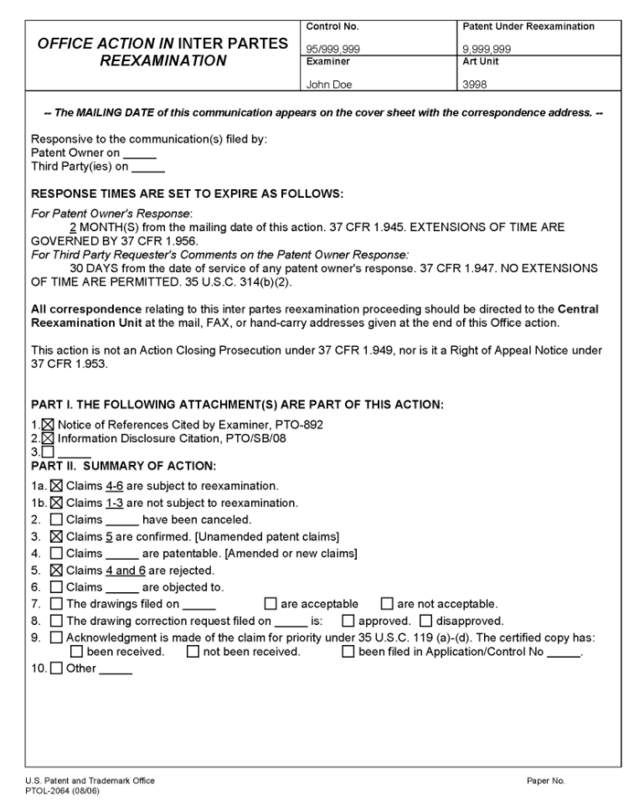 Where the request for reexamination includes material such as a claim chart to explain a proposed rejection in order to establish the existence of a substantial new question of patentability (for a reexamination filed under that standard), or a reasonable likelihood that the requester will prevail (for a reexamination filed under that standard), the examiner may bodily incorporate the claim chart (or other matter) within the Office action. The examiner must, however, carefully review the claim chart (or other material) to ensure that any items incorporated in a statement of the rejection clearly and completely address the patentability of the claims. For actions subsequent to the first Office action, the examiner must be careful to additionally address all patent owner responses to previous actions and third party requester comments. Ordinarily, there will be no patent owner amendment to address in the first Office action of the inter partes reexamination, because 37 CFR 1.939(b) prohibits a patent owner amendment prior to first Office action. Thus, the first Office action will ordinarily contain no rejection based on 35 U.S.C. 112; a rejection based on 35 U.S.C. 112 is proper in reexamination only when it is raised by an amendment. The only exception is where the newly requested and granted reexamination is merged with an existing reexamination proceeding which already contains an amendment. In such a case, the first Office action for the new reexamination would be a subsequent action for the existing reexamination, and the amendment in the merged proceeding would be examined for any 35 U.S.C. 112 issues raised by the amendment and any improper broadening of the claims under 35 U.S.C. 314. In view of the requirement for “special dispatch” in inter partes reexamination proceedings (35 U.S.C. 314(c)), it is intended that the examiner will issue an ACP at the earliest possible time. Accordingly, the first action should include a statement cautioning the patent owner that a complete response should be made to the action. The first action should further caution the patent owner that the requirements of 37 CFR 1.116(b) will be strictly enforced after an ACP and that any amendment after the ACP must include “a showing of good and sufficient reasons why they are necessary and were not earlier presented” in order to be considered. Form paragraph 26.05 should be inserted at the end of the first Office action followed by form paragraph 26.73. The Office action cover sheet is PTOL-2064. Where the Office action is a first Office action, the space on the PTOL-2064 for the date of the communication to which the Office action is responsive to should not be filled in, since it is the order for reexamination that responds to the request for reexamination, not the first Office action. As with all other Office correspondence on the merits in a reexamination proceeding, the first Office action must be signed by a primary examiner. Upon receipt of a patent owner response to the action (and third party requester comments where permitted) by the CRU, or upon the expiration of the time to submit same, the examiner will be internally notified. The examiner will prepare for and set up a panel review conference pursuant to MPEP § 2671.03, to discuss the issuance of the Office action. The examiner may prepare the Office action after the conference, or may prepare the Office action prior to the conference and revise it, as needed. If the conference confirms the examiner’s preliminary decision to reject and/or allow the claims, the Office action shall be issued and signed by the examiner, with the two or more other conferees initialing the action (as "conferee" ) to indicate their presence in the conference. A sample of a first Office action in an inter partes reexamination proceeding for a reexamination filed under the substantial new question of patentability standard is set forth below. The examiner should leave the paper number blank, since IFW files do not have a paper number. This first Office action on the merits is being mailed together with the order granting reexamination. 37 CFR 1.935. Claims 1-3 of the Smith patent are not being reexamined in view of the final decision in the ABC Corp. v. Smith, 999 USPQ2d 99 (Fed. Cir. 2008). Claims 1-3 were held invalid by the U.S. Court of Appeals for the Federal Circuit. (a) A patent may not be obtained though the invention is not identically disclosed or described as set forth in section 102 of this title, if the differences between the subject matter sought to be patented and the prior art are such that the subject matter as a whole would have been obvious at the time the invention was made to a person having ordinary skill in the art to which said subject matter pertains. Patentability shall not be negatived by the manner in which the invention was made. Claims 4 and 6 are rejected under pre-AIA 35 U.S.C. 103(a) as being unpatentable over Berridge in view of McGee. Berridge teaches extruding a chlorinated polymer using the same extrusion structure recited in Claims 4 and 6 of the Smith patent. However, Berridge does not show supporting the extrusion barrel at an angle of 25-35 degrees to the horizontal, using spring supports. McGee teaches spring supporting an extrusion barrel at an angle of 30 degrees, in order to decrease imperfections in extruded chlorinated polymers. It would have been obvious to one of ordinary skill in the polymer extrusion art to support the extrusion barrel of Berridge on springs and at an angle of 30 degrees because McGee teaches this to be known in the polymer extrusion art for decreasing imperfections in extruded chlorinated polymers. This rejection was proposed by the third party requester in the request for reexamination, and it is being adopted essentially as proposed in the request. Claim 5 is patentable over the prior art patents and printed publications because of the recitation of the specific octagonal extrusion die used with the Claim 4 spring-supported barrel. This serves to reduce imperfections in the extruded chlorinated polymers and is not taught by the art of record, alone or in combination. In the request, at pages 10-14, the third party requester proposes the claim 5 be rejected based upon Berridge in view of McGee, and further taken with Bupkes or Gornisht. The third party requester points out that both Bupkes and Gornisht teach the use of an octagonal extrusion die to provide a smooth unified extrusion product. This rejection of claim 5 proposed by the third party requester is not adopted. While Bupkes and Gornisht do in fact teach the use of an octagonal extrusion die to provide smooth unified extrusion product, Bupkes teaches such for glass making and Gornisht teaches such for a food product. Despite the argument presented at pages 12-13 of the request and the demonstration of exhibit A, the skilled artisan would not equate the advantages obtained by Bupkes and Gornisht for glass and food, respectively, to the removal of imperfections in a polymer melt being extruded to a solid plastic product. Thus, Bupkes and Gornisht are not deemed to be combinable with Berridge and McGee for purposes of rejecting claim 5. An issue has been raised in the present reexamination proceeding that is not within the scope of inter partes reexamination. In the above-cited final court decision, a question is raised as to the possible public use of the invention of Claim 4. This was pointed out by the third party requester in the request for reexamination. The issue will not be considered in the present reexamination proceeding. 37 CFR 1.906(c). Swiss Patent 80555 and the American Machinist article are cited to show cutting and forming extruder apparatus somewhat similar to that claimed in the Smith patent. In order to ensure full consideration of any amendments, affidavits or declarations, or other documents as evidence of patentability, such documents must be submitted in response to this Office action. Submissions after the next Office action, which is intended to be an action closing prosecution (ACP), will be governed by 37 CFR 1.116, which will be strictly enforced. For EFS-Web transmissions, 37 CFR 1.8(a)(1)(i) (C) and (ii) states that correspondence (except for a request for reexamination and a corrected or replacement request for reexamination) will be considered timely filed if (a) it is transmitted via the Office’s electronic filing system in accordance with 37 CFR 1.6(a)(4), and (b) includes a certificate of transmission for each piece of correspondence stating the date of transmission, which is prior to the expiration of the set period of time in the Office action. Normally, the title of the patent will not need to be changed during reexamination. In those very rare instances where a change of the title does become necessary, the examiner should point out the need for the change as early as possible in the prosecution, as a part of an Office action. This will give the patent owner an opportunity to comment on the change prior to the examiner’s formal change in the title via an examiner’s amendment accompanying the Notice of Intent to Issue Inter Partes Reexamination Certificate (NIRC) at the time that the prosecution of the reexamination proceeding is to be terminated. A change in the title in a reexamination can only be effected via a formal examiner’s amendment accompanying the NIRC. Changing the title and merely initialing the change is not permitted in reexamination. While a change in the title may be commented on by the patent owner, the final decision as to the change is that of the examiner, and the examiner’s decision is not subject to review. Accordingly, where the examiner notes the need for a change at the time of issuing the NIRC, the examiner may make the change at that point, even though the patent owner will not have an opportunity to comment on the change. An example of a situation where it would be appropriate to change the title is where all the claims directed to one of the categories of invention (in the patent) are canceled via the reexamination proceeding, it would be appropriate to change the title to delete reference to that category. If an unamended base patent claim (i.e., a claim appearing in the patent) has been rejected or canceled, any claim undergoing reexamination which is directly or indirectly dependent thereon should be indicated as patentable if it is otherwise patentable. The dependent claim should not be objected to nor rejected merely because it depends upon a rejected or canceled original patent claim. No requirement should be made for rewriting the dependent claim in independent form. As the original patent claim numbers are not changed in a reexamination proceeding, the content of the canceled base claim would remain in the printed patent and would be available to be read as a part of the dependent claim. If a new base claim has been canceled in a reexamination proceeding, a claim which depends thereon should be rejected as indefinite. If an amended base patent claim or a new base claim is rejected, a claim dependent thereon should be objected to if it is otherwise patentable, and a requirement should be made for rewriting the dependent claim in independent form.